Britain and Germany come together in this rehash with a brat-based venison bubble and squeak. Oh, bubble and squeak. It’s the quintessential British holiday leftover, traditionally consisting of potatoes and cabbage but is really just potatoes mixed with whatever is leftover from your holiday dinner. You kind of just throw it all in there. This means there really are endless variations to this dish. 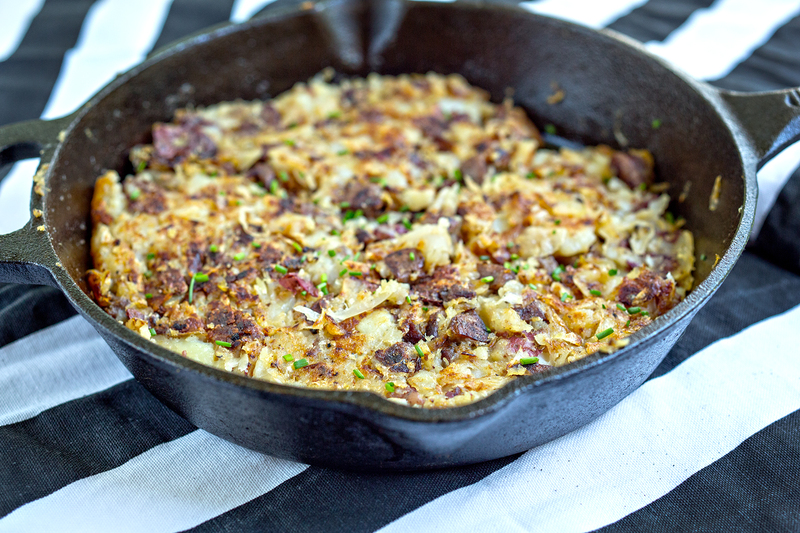 I’ve been wanting to make bubble and squeak but wanted a little more creative variation to it, especially since it isn’t exactly roast season in Texas for another two months or so. Oktoberfest provided the perfect backdrop! The ingredients are the same, just with more vinegar and some leftover bratwurst thrown in. I wasn’t exactly sure how this would turn out; sauerkraut in bubble and squeak? The result ended up pretty delicious. Tangy from the sauerkraut but sweet from the potatoes. Despite my adjustments, the dish did, in fact, squeak as it started cooking. I suggest using a cast iron skillet for this one. You want it to get nice and hot, and that way if you get tired of letting it sit, then mixing, then letting it sit, etc, you can always finish it in the oven to get everything to crisp up. This is super great as its own meal, as a side, or even as breakfast with a fried egg on top. Heat a cast iron skillet over medium heat (about a 4-5). Add the diced bratwurst, tossing occasionally, and cook until the fat starts to render out and they start to brown and crisp up. Meanwhile, mix the boiled potatoes, sugar, cider vinegar, and sauerkraut and gently mash together like a loose mashed potato. When the bratwurst is crispy, transfer to the potato mash and mix until combine, making sure to leave plenty of fat in the skillet. Depending on how much fat rendered from the sausages, add 1-2 T of a flavorful fat to the pan. Put the potato mixture in the pan and flatten like a giant thick pancake. Let cook for about 5 minutes, until the bottom starts to brown. Flip the mixture around, pat down and let cook another 4-5 minutes. Keep doing this, turning the mixture and re-patting it down as it browns on the bottom, being careful not to let it burn. It's done when most of the mixture is a golden brown color with crispy bits throughout. Serve warm. Non-game substitution: This begs for bratwurst, but any German sausage will work. 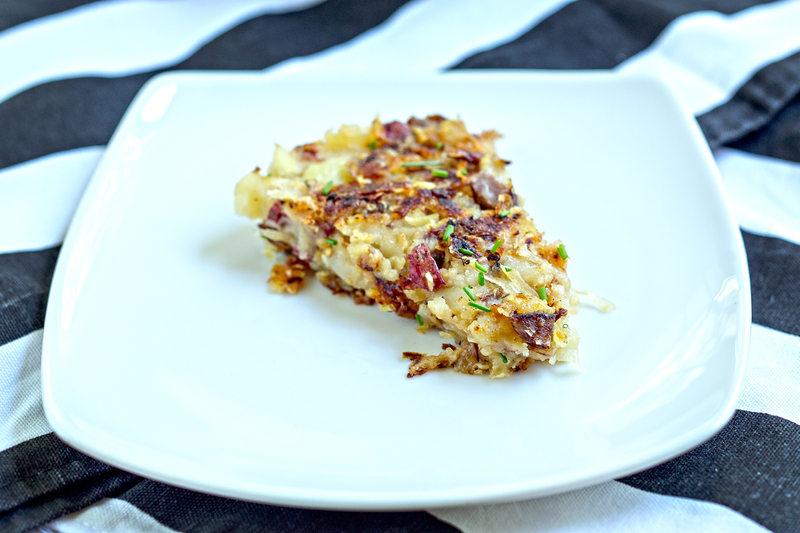 2 Comments on "Nurse your Oktoberfest Hangover with a Re-hash"
My mother, your great grandmother used to make this. She used it with whatever leftovers were there, usually on Thursday, but always potatoes,,even fresh ones. Brings back memories and sounds good. Oh my gosh, I was making a family recipe and I didn’t even know it! We’ll have to make it again the next time I see you. It was pretty delicious, we ate it either for lunch or as a side the whole week!